Herniation of an intervertebral disc’s contents may result from the stretching of or a tear in the annulus fibrosus. 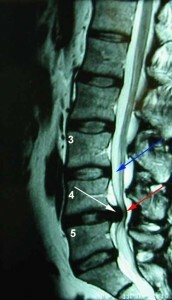 Disc material then may enter the spinal canal or neuroforamen resulting in symptoms. Disc herniations occur in the cervical spine (neck), the thoracic spine, or in the lumbar spine (lower back). Factors that lead to a slipped disk include aging with associated degeneration and loss of elasticity of the disks and supporting structures; injury from improper lifting, especially if accompanied by twisting or turning; and excessive strain forces associated with physical activities. 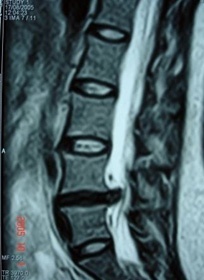 Sudden forceful acute trauma is an uncommon cause of a slipped disk. You should consult with your doctor for any back pain significant enough to limit activity, any back pain that lasts more than a few days, or any back pain associated with numbness or weakness, loss of bladder or bowel control, fever, or abdominal or chest pain. The doctor may suggest an urgent office evaluation or may advise you to go to the hospital’s emergency department. Any injury that may suggest more significant back or neck problems, such as a fall from a height or a direct blow to the spine, should be evaluated at the hospital’s emergency department. Consider calling 911 for an ambulance. Medical teams can immobilize the spine and protect against further damage. You should also seek emergency evaluation if the pain or symptoms are severe enough to prevent you from walking, are associated with severe numbness or weakness of any extremity, are associated with loss of bowel or bladder control, or are associated symptoms not readily explained by the spine problem (such as fever, abdominal pain, or chest pain). Plain X-rays (and even computerized axial tomography, CAT scans) cannot depict a prolapsed disk and can only identify bony abnormalities. 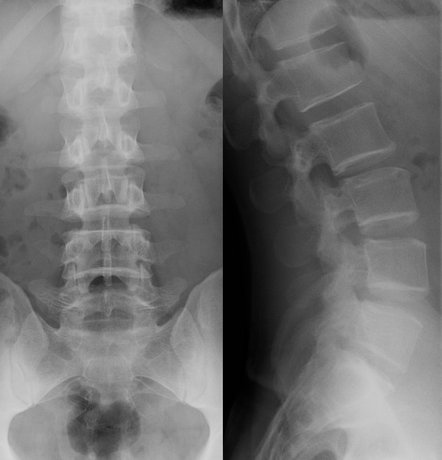 These X-rays are best used to evaluate back pain that is from causes other than a prolapsed disk, such as bony displacement, tumor, or broken bone. Most young or middle-aged people without a history to suggest trauma or tumor are best served without the expense and radiation associated with obtaining these X-rays. In most cases, the bones seen on X-ray are normal. More specialized tests include magnetic resonance imaging (MRI) or myelogram (which involves injecting a contrast dye into the spinal column). These are ideal for diagnosing a deformed disk and how a specific nerve is affected. In the absence of signs or symptoms suggesting severe nerve damage, however, these studies are very rarely indicated or ordered early in the course of the evaluation. This is because of cost, availability of the test, and the fact that the findings rarely affect initial treatment decisions. Your doctor may obtain these tests after a course of treatment fails to provide you relief. In lower back lumbar disc herniation, pain and/or numbness follows the irritated nerve root, typically down the back of the leg, side of the calf, and possibly into the side of the foot. For this reason, a herniated lumbar disc characteristically produces sciatica but not back pain. Impairment of motor function of the root will cause weakness in raising and lowering the ankle or big toe, depending on the particular nerve root. Very large disc herniations may result in urinary difficulty and constipation. In cervical disc herniation, the spinal cord as well as the nerve roots may be compressed. The symptoms and signs produced are the result of nerve root compression, spinal cord compression, or both. The most common complaint is neck pain and limited neck motion. Pain also may radiate into the arm, in a pattern characteristic of the particular root involved. In most cases, pain begins upon waking up. Thoracic disc herniation presents most commonly as chest pain or spine pain, and occasionally in numbness, weakness, or spasticity. Radicular symptoms occur but are more difficult to discern due to the overlapping dermatomal distribution of nerve roots. 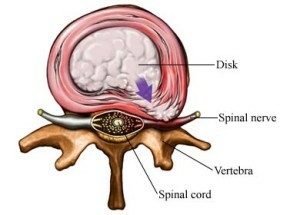 If the disc herniation compresses the spinal cord, may result. The radiographic evaluation of a suspected spine disorder begins with a plain x-ray. A herniated disc, being composed of soft tissue rather than bone, will not be seen on x-ray; however, other associated changes may be seen, such as the characteristic bony ridges of cervical spondylosis. In addition, the alignment can be accurately assessed. MRI has in most cases become the study of choice in disc herniation. Its superior resolution of soft tissues gives good definition of disc material, cord compression, and root compression. When bony detail is required, a myelogram/CT should be obtained. It is more invasive than MRI and may produce effects such as headache, but in some cases may be essential in defining the anatomy. The doctor often prescribes bed rest or limited activity for several days followed by gradual increase in activity over the next few weeks. Strict bed rest is generally not advised because people with back pain have been shown to recover more quickly with normal activity as long as lifting, bending, and straining are limited. Treat with ice or cold packs early after an injury and switch to heat later. Heat may be used early if the pain and symptoms are not caused by a sudden injury. About 10 percent of people with herniated disks eventually need surgery. You may be a good candidate for surgery if conservative treatment fails to improve your symptoms after four to six weeks. 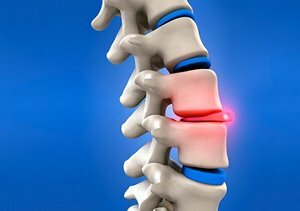 Surgery also may be considered if a disk fragment lodges in the spinal canal, pressing on a nerve, or if you’re having trouble standing or walking. The most common surgery for a herniated disk is a microdiscectomy. 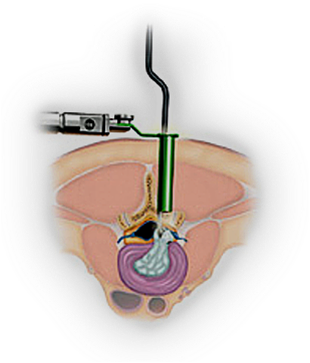 This procedure has the best success rate among healthy people with single disk herniations. * You’re placed under general anesthesia, which means you won’t be conscious during the surgery. In some cases, though, microdiscectomy is possible without general anesthesia, using injections that cause temporary numbness (local anesthesia) in the back. * The surgeon makes a small incision over the herniation and moves the back muscles away from the spine as much as possible. Small amounts of bone and ligaments may be removed to gain access to the herniated disk and nerve root. * Small instruments are used to remove the herniated portion of the disk and other disk tissue and fragments, relieving pressure on the nerve. * The incision is closed with stitches or staples.